When I began to do freelance writing and editing full-time, I thought all I’d need was my laptop and an Internet connection to do my work efficiently. 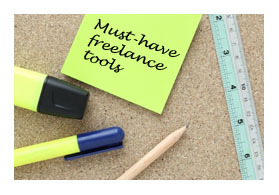 The longer I have freelanced, the more tools I’ve discovered to help me be a more efficient and productive writer and editor. 1. Evernote. I first heard about Evernote Web Clipper from a genealogy magazine I frequently write and edit articles for. The editors there loved this free tool, and now so do I. 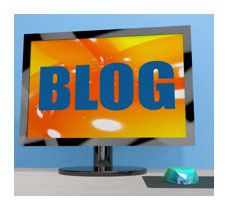 It provides a great way to save articles you see online and organize them. It helps me keep any info I use as source material in a safe place where I can find it again if editors need it for fact-checking. It also gives me a single place to put items I see that spark story ideas I want to pitch later. 2. My all-in-one printer. I didn’t realize how important an all-in-one printer/scanner/copier was to my business until my old all-in-one stopped working. All of a sudden one day, it wanted to eat the paper instead of print on it. After a few nights of online research, I ended up purchasing an Epson WorkForce WF-7520. It has an auto document feeder (great for scanning and copying), prints double-sided sheets of paper, and prints on 11×17 paper. Even though I read the dimensions of the printer online, its large size still surprised me when I unpackaged it (my husband has nicknamed it Big Bertha), but despite the desktop space it hogs, I love it! It has made my life easier since I got it. Scanning is quicker. I save paper by printing on both sides of a sheet. And I don’t have to squint to read miniscule type when I need to print and proofread book or magazine spreads. 4. Dropbox. I use Dropbox often for getting large files (like photos for stories) to my editors. It’s way better than sending dozens of emails with super large attachments. And it’s free. 5. Pandora. Let’s face it: writing in a room by yourself can get very quiet, sometimes eerily quiet. When it gets too quiet or I need a little energy or creativity boost, I turn on a Pandora channel. The music provides good company, and helps the words flow from my fingertips to my Microsoft Word document. Do you have any tools you use every day to help make you more productive? Post a comment or tweet me on Twitter @DanasCreative to share your favorite productivity tools. Is it health care or healthcare? E-mail or email? How about a Web page or a web page? These are just a few of the terms I see used in varying ways from client to client and publication to publication. As an editor, one of my pet peeves is inconsistency. In some cases there’s no “right” way to write or edit something, and that can lead to inconsistency. One way to improve consistency of word usage, punctuation, spelling, and more is to create an editorial style guide for your organization or publication. Why is it worth spending valuable time creating a style guide? Here are five reasons. 1. To make a good impression. Many of the details editors look at—placement of commas, whether a word is capitalized or not, etc.—may seem trivial. But when all of those items are used properly, it helps you make a good impression to your target audience. Your audience will never see your actual style guide, but they’ll see the results of it in your high quality, professional print and digital publications. 2. To set the tone. An editorial style guide can help you determine the style and tone used in all communications materials your company produces. If you want an edgy voice, it can address that and provide suggestions for terms or usage of certain terms to achieve the voice you want. 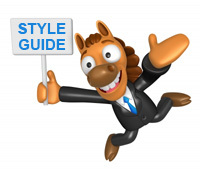 If you want a more formal voice, a style guide can address that, too. 3. To empower you and your staff to make decisions. 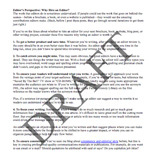 For most companies and universities I work with, there’s an approval process that most communications pieces need to go through. Sometimes individuals reviewing a communication piece will focus on the content, while other times they’ll focus on the details. 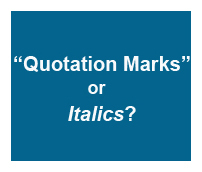 If you have a style guide, and a colleague asks you to make a change such as add a comma or capitalize a word that shouldn’t be changed, you can rely on your style guide to back up your decision not to make the change. It shows others you’re making decisions based on a set of standards, rather than making decisions based on your own personal preferences. 4. To address usage of unique terms. The Associated Press Stylebook and the Chicago Manual of Style cover a lot of style issues, but they don’t cover all terms you may use. By creating your own editorial style guide, you can address any editorial items unique to your industry or company that aren’t covered by a standard style guide. For example, one university I work with uses healthcare as one word in all instances; another uses it as two words (health care) when it’s used as a noun, and healthcare (one word) when used as an adjective. 5. To ensure accuracy no matter who is writing or editing. Editorial style guides for my university clients often include information on how to talk about different degrees (e.g., Master of Science vs. master of science vs. master’s degree), names of campus buildings, and more. The guides help to make sure that all people creating copy across the university are using the same terms. When staff turnover occurs, it’s easy for the next person to pick up the guide and make sure they are using the appropriate names and terms in all communications pieces they produce.